A bridge linking Russky Island with the mainland in Vladivostok. The forum will be held in Vladivostok on September 2-3. 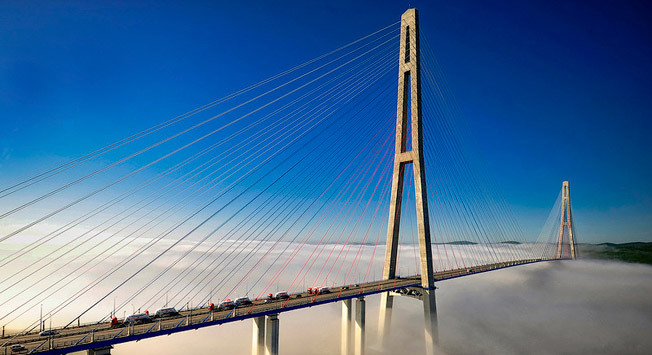 At least 2,400 EEF participants are expected at the second Eastern Economic Forum (EEF), which will take place in Vladivostok on September 2-3, the forum’s organizing committee reported on July 14. “It is expected that the Second Eastern Economic Forum will have at least 2,400 visitors, including representative delegations from China, Japan, South Korea, India, Vietnam, Australia, the USA, and Singapore. Participation by some representatives of the World Economic Forum and other institutions is also planned," the committee said.